The Bosnian Serb commander, after dealing the United Nations a humiliating defeat, personally oversaw the deportation of thousands of refugees from the conquered Srebenica "safe area" on Wednesday. General Ratko Mladic drove into the main headquarters of U-N peacekeepers and ordered thousands of refugees - mainly women and children - into buses and trucks heading out of Serb-held territory. But Mladic also ordered all males over the age of 16 to be taken away for what he called "screening for war crimes". Bosnian Serb Television shows Rebel Serb soldiers handing out chocolate and cigarettes. These women and children are starving, no food aid has got into the Srebenica safe zone for days. Bosnian Serb forces have consolidated their positions around the "safe zone" Wednesday. The Serbs moved rapidly to secure the area and to round up refugees. The Dutch U.N. troops could do little with a Serb tank at their camp gate and mortars and rocket launchers aimed at the 40 thousand civilians milling around in the 31 degree Celsius (88 degree Fahrenheit) heat. Serb military chief General Ratko Mladic arrived to take personal charge of the operation, to transport refugees out of the "safe zone". The Dutch shared with the refugees food and water meant for half the U.N. contingent of 400, and managed to get a Dutch peacekeeper on each bus and truck. General Mladic said all males over 16 would be transported to nearby Serb-held Bratunac, where they would be "screened for war crimes,"
The first three-thousand refugees - mostly women, children and the elderly - have boarded buses and are being taken away from the "safe area" to central Bosnia. The trip to a government-held area will cover 25 miles - but the refugees will have to walk the final ten miles. It's not immediately known what will happen to the Dutch peacekeepers who remained in Potocari. They are expected to run out of food and water by noon Thursday. Srebrenica Bosnia 12 July 1995. 1. Various shots of Bosnian Serb troops handing out chocolate and cigarettes to children refugees. 2. Various shots of Serb soldiers securing road. 3. Wide shot of refugees making their way to join main group of refugees. 4. Wide shot of thousands of refugees. 5. Various of U-N soldiers standing by refugees. 6. General Ratko Mladic arrives. 7. Mladic talks to refugees. 8. Women and children make their way to buses. 9. Various shots of women and children boarding buses. The Bosnian Serb army confirmed Wednesday they'd seized the Muslim "safe area" of Zepa in eastern Bosnia. The reported capture comes eight days after the rebel Serbs seized the so-called "safe area" of Srebrenica, just north of Zepa. The United Nations spokesman in Bosnia Alexander Ivanko said U-N Commanders had received confirmation from the Bosnian Serbs that the enclave of Zepa had surrendered. 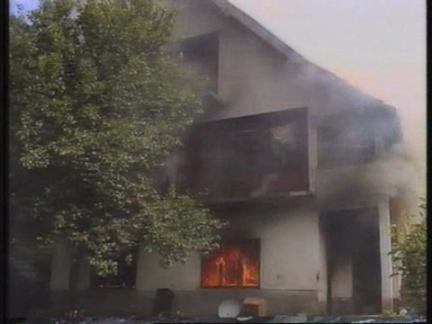 Meanwhile near Sarajevo, the Bosnian village of Hrasnica continues to come under Bosnian Serb bombardment. Residents of Hrasnica have suffered almost daily from Serb shelling and sniper fire. The village of Hrasnica is situated at the foot of the perilous Mount Igman road into Sarajevo and is just one kilometre away from the Serb-held town of Illidza. Hrasnica's proximity to Serb-held territory and its strategic position near the only route into the capital make it a frequent target of the Serb forces. Today's attack is just the latest in the relentless volley of sniper fire and shelling. The population of around 2,000 are used to running for cover - an average of five shells hit the village every day. And at night tank fire and anti-aircraft fire are frequently heard as Serbs target vehicles moving along Mount Igman road. A large number of Hrasnica's villagers spend all day and all night hiding in basements, emerging only momentarily to carry out essential tasks. Meanwhile, at a United Nations briefing in Sarajevo, spokesman Alexander Ivanko confirmed the fall of yet another so-called safe area into Bosnian Serb hands. Zepa had been expected to fall since Serbs seized the larger "safe area" of Srebrenica to the north last week. The fall of the remote mountainous enclave of Zepa set the stage for another flood of refugees who fear murder and torture if they stay. Ivanko said the Sarajevo government had asked the United Nations to provide security for the thousands of Muslims the Serbs plan to expel. "It is our understanding that the Bosnian President appeared to accept that Zepa had in fact fallen. The President asked UNPROFOR to provide security for all the refugees. This morning UNPROFOR representatives, it is my understanding, both military and civilian have been dispatched to Zepa to monitor the situation, and to liaise with both the Bosnian Government , and Bosnian Serb forces on the ground." The capture of Zepa widens Serb control over a strategic swath of land between Sarajevo and the Serbian border. It's also a severe blow to the U-N peacekeeping mission in Bosnia, which has already been criticised as ineffectual. Only one more Muslim enclave, Gorazde, lies in that region, and Serbs are expected to make it the target of their next major assault. Meanwhile, European Union (EU) special envoy to former Yugoslavia, Carl Bildt arrived in the Croatian port of Split last (Wednesday) night after meeting Serbian President Slobodan Milosevic in Belgrade. Bildt, who is conducting a last round of talks with key players in the Bosnian conflict, told reporters there may have been some progress regarding Serbian recognition of Bosnia. Bildt travels to Sarajevo later today for talks with Bosnian President Alija Izetbegovic and UNPROFOR commander in Bosnia, General Rupert Smith. On the way to yet another destination, Carl Bildt's hectic diplomatic shuttle shows no sign of abating. The E-U's special envoy to the former Yugoslavia is nearing the end of a final round of talks with key players in the Bosnian conflict. In a week when the U-N peacekeeping mission has been hit by the most serious crisis yet in the three-year Balkan war, negotiations are at a critically delicate stage, but Bildt cautiously hinted at signs of a breakthrough. "It has been an exceedingly difficult situation for the past week, two weeks, I think there might be some progress now that might be not insignificant both in terms of what's happening on the ground, in terms of the situation that we have and in terms of political issues". Following his talks with Bosnian president Alija Izetbegovic and UNPROFOR commander in Bosnia, General Rupert Smith, Bildt's frantic travel schedule continues when he travels to London ahead of Friday's meeting of the five nations contact group. 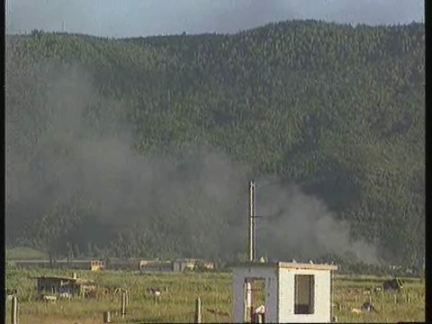 1.Various of smoke rising from building in Hrasnica after shelling. 2.Various of aftermath of shelling. 3.Close-up smoke coming out of shelled apartment block. 5.Various people hiding in basement. 6.Hrasnica woman saying the Serbs have shelled their building. 7.Various of people in basements. 8.U-N spokesman Alexander Ivanko sitting next to Lieutenant-Colonel Gary Coward at press conference. 11.General view Carl Bildt talking to reporters at airport departure lounge. 14.Bildt being shown towards car. 15.U-N convoy of cars driving off. The Kosovo capital of Pristina took several heavy blows from NATO forces on Wednesday night. And wailing air-raid sirens again cleared the streets of Pristina by early afternoon on Thursday. Residents braced themselves for more NATO air assaults and possible retaliation attacks by angry Serbs. Yugoslavia defiantly absorbed its first night of punishment from NATO air power. It claims ten people were killed and thirty eight wounded overnight in an aerial barrage intended to force President Slobodan Milosevic to make peace in Kosovo. The army reiterated its defiance after a night of strikes on more than 50 targets, saying the "high morale of the units was preserved." But for the ordinary residents of Pristina, there was little they could do as bombs rained down from the sky. Some merely looked out from their balconies at the air assault around them, then retreated inside. NATO's most spectacular hit was a heavy strike around midnight on an industrial plant to the southwest of the city, beside the main military barracks. General Guthrie, NATO spokesman said the British vessel HMS Splendid fired its first Tomahawk missile against a key military radar facility located near Pristina airfield. He said this facility housed two highly capable air defence radars and an associated control building. It was reportedly capable of providing extensive data to Yugoslavian air defence forces, fighter aircraft, surface to air missile units and anti-aircraft artillery. Some two dozen journalists were arrested as they tried to watch the assault from the roof of a Belgrade hotel. All but one were eventually released. In the cold light of day, soldiers surveyed the scenes of destruction in the city. Power was restored to parts of blacked-out Pristina at dawn but water supplies were intermittent. The normally bustling streets of the Kosovo capital were eerily quiet. Air raid sirens again blared on Thursday and the state news agency reported more fighting in Kosovo. General Wesley Clark, the NATO supreme commander, said that the allied operation "will be just as long and difficult as President Milosevic wants it to be." 11. Rubble on roadside, building with roof caved in. polling station damaged by grenade. 1/3 - More Bosnia voters. Montenegro poll on whether to unite with Serbia. The U.S. head of peace verifiers in Kosovo, William Walker, on Saturday visited the site of a massacre where at least 35 ethnic Albanians were killed, describing what he saw as "horrendous". Mr Walker said it appeared the victims had been shot execution-style and that whoever did it had no value for human life. It's the worst killing spree since an October truce largely halted more than seven months of combat in the troubled Serb province. The day after Serb forces launched a fierce assault on the area, the bodies of 35 people, many of them mutilated, have been discovered on a hillside in Kosovo. The American chief of the monitoring mission run by the Organization for Security and Cooperation in Europe, was visibly shaken after touring the site just hours after the massacre. Journalists and Kosovo Verification Mission representatives accompanied Mr Walker on his tour. Villagers said Serb police had separated men from their families and led them toward the local police station. Residents claim the Serb forces later turned and herded them up the hill, where they killed them. Bodies apparently lay where they were slain, along cow paths and in deep, hilly ravines. Serbian police claim dozens of mutilated bodies in civilian clothes found on the site were armed rebels killed in combat. A police statement says what it calls "terrorists" were killed in an exchange of gunfire after they attacked police with automatic weapons and mortars. It also says most of those killed wore uniforms with the insignia of the -- quote -- "terrorist K-L-A." Yugoslav tanks and troops were part of the attack, pounding the area before fighting abated on Friday afternoon. Verifiers and journalists heard villagers tell of a grisly massacre, but Serbian authorities didn't allow them to visit the site on Friday. It was the worst killing spree since an October truce largely halted more than seven months of combat in the separatist province, and perhaps the most savage of the nearly yearlong conflict. The informal ceasefire, which international officials have insisted is still largely intact, is now in serious danger of collapsing into a resumption of the province-wide fighting that devastated Kosovo in 1998. More than a thousand people - mostly ethnic Albanians - have been killed since Yugoslav President Slobodan Milosevic launched an offensive last February to try to crush separatist militants and reinforce government control over the Albanian-majority province in Serbia. victory. Mladic offered profuse congratulations to his troops. (SREBENICA, 12/7) Refugees in distance, soldiers flanking them. approaching refugees. Refugees crying. Pan across refugees. Mladic speaking to UN peacekeeper. Croats and Serbs refuse to pull back. reactions over worth of settlement. troops ignore deadline to turn the area over to UN. 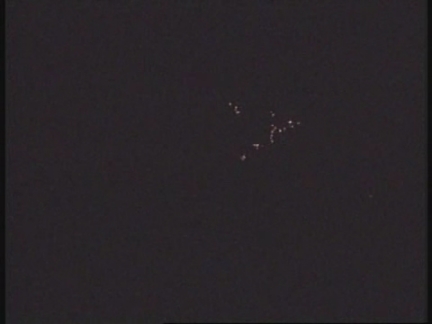 Wednesday although machine gun and anti-aircraft fire continued. were continuing their assault on the UN-designated safe area. Serb television has taken what it says is a deadly hit from NATO. An allied missile hit the Belgrade headquarters of Serbia's state television on Friday, causing its top two floors to collapse. The Serbs say at least two people died in the attack - many others were injured. It was a scene of devastation. 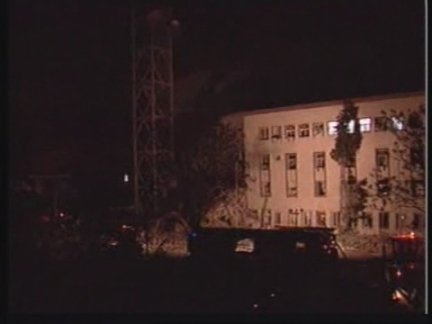 Serbia's main television station (R-T-S) took a direct hit as NATO airstrikes continued early on Friday. It took the station off the air midway through the broadcast of a recorded interview with President Slobodan Milosevic. When the station resumed broadcasting after six hours - by broadcasting from another transmitter - it reported that the attack had killed two staff members and injured 18 others. Rescue workers struggled to contain the fire whilst trying to release people trapped inside. Two floors of the building collapsed, scattering debris and crushing everything beneath. Firefighters were helped by police as they tried to remove the injured from the rubble. One survivor had a lucky escape when the floor beneath him collapsed. "From that shaking (from the bombs) I suddenly found myself in studio three, which is under studio one, and that is one floor below." By dawn on Friday, more people had joined the rescue efforts. Firefighters were still battling to kill the fire. The search for people trapped in the collapsed shell of the building also continued. The Serbian information minister blamed President Clinton and Britain's Prime Minister Tony Blair for the devastation, calling them -- quote -- "the biggest criminals and beasts." NATO had warned it would strike broadcasting facilities. It had previously argued that the broadcasting facilities were used by President Milosevic to relay military communications and were also a source of anti-NATO propaganda. This is unlikely to be the last such strike. Attempts to exhume and identify bodies from mass graves. "The problem is the secondary mass graves. In many of these graves Serbs overrun the bodies with bulldozers and some body parts were taken to other locations. It is difficult to identify the bodies and connect its body parts. We have 4419 body bags here, but only three thousand bodies. We have identified only 128. We have to wait for the results of the DNA testing." "I think that we have to put names on the graves of our men. It is good that we are going to Srebrenica to mark the anniversary, but life cannot really start again until the graves of our men have names on them." Investigators from the International War Crimes Tribunal in the Hague have found a mass grave containing more than 200 bodies believed to be victims of the Srebrenica massacre which happened during the Bosnian war six years ago. The bodies of the victims, which were discovered over the last few days, are being kept in a newly-built Tuzla morgue. Zlatan Sabanovic, the morgue's pathologist, claims many bodies of Srebrenica victims have not been identified because Serbs who are blamed for the massacre have tried to cover up their atrocities. More than eight thousand Bosnian Muslim men are estimated to have been summarily executed following the fall of the UN protected "safe" area of Srebrenica to the Bosnian-Serb Army on July 11th 1995. The International Committee of the Red Cross continues to list some seven thousand people from Srebrenica as missing. The Bosnian Commission for Missing Persons and the Tribunal have so far exhumed over four thousand human remains in the area, out of whom only about 100 have been identified. 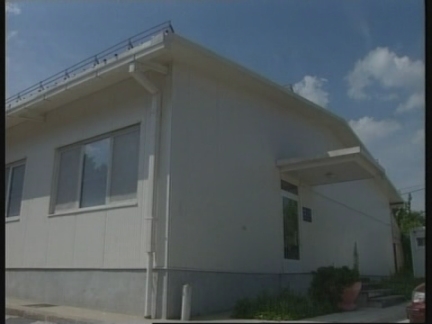 The International Commission for Missing Persons (ICMP) started a "Podrinje Identification" project in Tuzla and built one of the most sophisticated DNA laboratories in Europe. Staff at the lab are working 24 hours a day to identify human remains from mass grave pits in Srebrenica. Five years after the war, Srebrenica survivors live in difficult conditions in refugee settlements outside of Tuzla and in suburbs of Sarajevo. They say there is no peace for them until the victims are buried properly. On Wednesday, the 6th anniversary of Srebrenica massacre, a marble stone with the inscription "Srebrenica, July 1995" will be unveiled to mark the site where victims will be reburied. Few Muslim families from Srebrenica escaped unscathed and almost all of them have suffered the death or disappearance of several close relative. Habiba Gusic, 62, lost her husband and five other close relatives. Her husband's body was never found and she says Muslim families will only rest when there are names on the graves of their men. Srebrenica refugees are glad that some of the organisers of the atrocities are facing trial at the Hague now, but they say that only death penalty can be sufficient for what Ratko Mladic and Radovan Karadzic, who have both been indicted by the Hague tribunal, did in Srebrenica. Meanwhile American peacekeepers have moved into Serbrenica area in force to provide security for the site of the massacre anniversary after Serb hard-liners said they would try to disrupt Wednesday's ceremony.